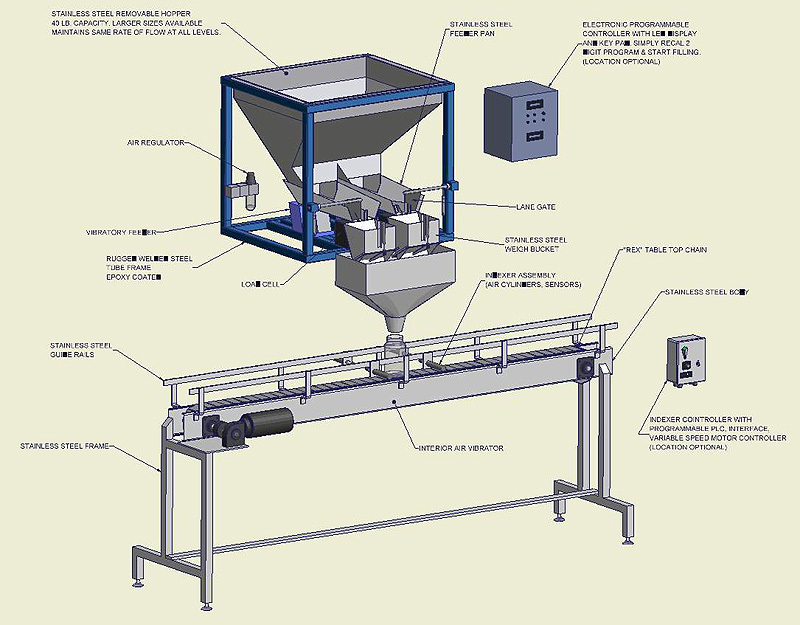 Twenty years experience in scale automation has produced the SF 1095, the most foolproof and economical weighing system available. The 1095 was designed by coffee people, for coffee people, for products from fine ground coffee or tea to whole beans – even wrapped candies! A 2 digit code recalls factory set parameters for commonly used weights (2, 4, 8, 10, 12, 16 oz / 50, 100, 250, 300, 500 g), or as requested, with accuracy to 1/100 oz (1/10 gram). In addition, 250 custom products / weights can be added with no special knowledge or training. This means the machine runs the same, every time, without set up or adjustment. All contact parts are stainless steel, removable, and washable, for quick easy disassembly and cleaning.